When we returned from Halifax last night, it was time to deal with the third step of brewing this mojito kit. The gravity was right in the middle of the range that was acceptable, so I did the steps as ordered; mixing two packets with water and adding it to the carboy, stirring the heck out of it for two minutes, then adding the isinglass (still can't get over the fact it's made from the swim bladders of fish) and stirring for two more minutes. At this point, I had to check that the beer was degassed enough to continue. I took a sample, shook, and I got the pressurized "pssh" that I didn't want to hear. I tried it a couple more times - stir like mad, take a sample, "pssh". The instructions are fairly vague, and just say I may need to do a significant amount more of stirring to degas it if the temp was too cool. Well... I stirred the bejeezus out of the stuff for, I bet, twenty extra minutes in total at least. After all was said and done, I was still getting a "pssh". I said "Frig it," and capped it off. My father had a good idea today about cutting the end off a spoon and putting the spoon into a drill rather than buying the stirring attachment. I may do that next time... if there's a next time. 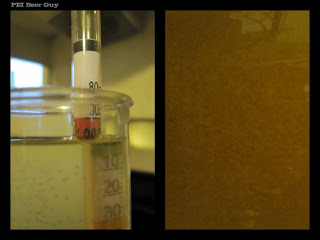 The second pic you can see is the rapid dropping out of sediment after I stopped stirring. Basically, things lump up inside like crystallized honey and fall gently like snow. I'll be interested in seeing how well this clears after my vigorous and lengthy (yet apparently insufficient) stirring session.